Liz Soares: The Beatles' 'White Album' served as soundtrack for era when 'we were living in a mess' . Beatles Radio: The Beatles, Solos, Covers, Birthdays, News The Fab 4 and More! In the late fall of 1968, I walked to the school bus stop at the corner of my street. My neighbor, Frank, was already there. He was 11 and I was 12. Frank was holding a record album, which he proudly showed me. 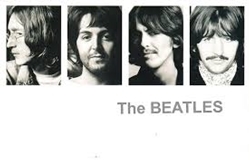 It was, of course, the double-record set that would come to be known as “The White Album.” At age 50, it is an undisputed cultural icon. At the time, to a sixth-grader, it was an oddity. In that pre-internet era, without a 24-hour cable news cycle and social media, I doubt that I knew this album was coming. I was an avid listener of the local AM rock ‘n’ roll station, but even if the DJs had talked about it, I wouldn’t have paid much attention. My parents never let me buy rock albums. I had a metal box filled with 45 rpm singles, but I wouldn’t have an album of my own until I started earning my own money. Mom and Dad grew up during the Depression, so I just assumed they didn’t want to spend money on record albums. “The White Album” went for about $10, at a time when milk was a dollar a gallon. Singles were less than a dollar.